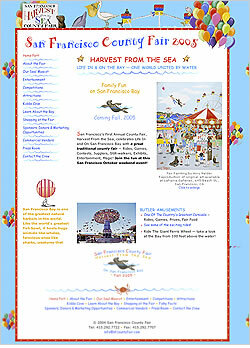 San Francisco's First Annual County Fair, Harvest From the Sea, celebrates Life In and On San Francisco Bay with a great traditional county fair — Rides, Games, Contests, Jugglers, Stilt-walkers, Exhibits, Entertainment, Magic in October 2005. The Web site is in a constant state of flux as plans and events are developed. As "show time" nears, the focus of the site will be expanded to include more details.